The third concept I will discuss from FISH! 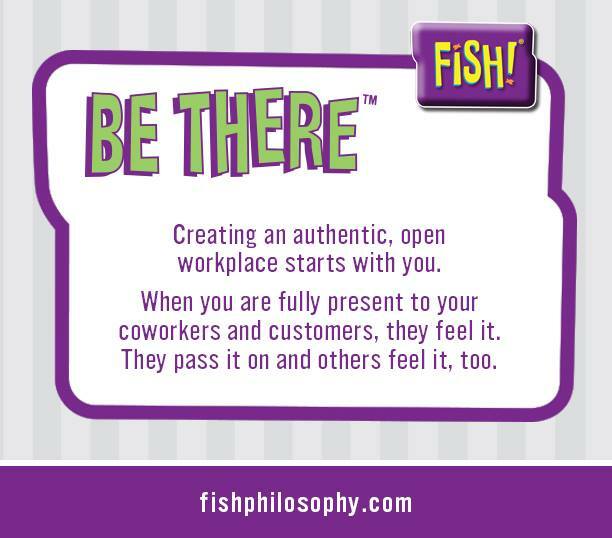 Philosophy is “be present.” It goes beyond the idea of physically being present when talking to a friend, customer, coworker, etc. It is about giving your full, undivided, attention – actively listening. This seems so simple, but I have found it takes a great deal of effort to do it – every time. When thinking about this blog post I came up with a list of situations I have found where being present is most important. Teleconference calls: This can perhaps be the toughest situation to be present because you are not physically in the room with other people. It is all too easy to surf the web or check your email as other people talk. I have done it and found that I don’t actually take anything away from the that conversation had while I wasn’t present. This has taught me to just close my eyes and take in the entire conversation, only stopping to write down notes. Business meetings: Sitting in a room full of people I have found two ways to not be present; daydreaming and using my computer. I write all of my notes via computer, so it is easy to switch over to check my email. That one moment takes me out of the room and then it takes more time to get back into the conversation. Daydreaming is tough because, honestly, many meetings are irrelevant. However, it is important to be present because you never know when someone will ask you a question or reference a conversation from the meeting. Customer conversations: Perhaps the most important time to be present is when you are talking to a customer. It doesn’t matter if it is on the phone or in person, being present in these situations can be directly connected to revenue. It is easy to tell when someone is present during conversation and when they are not. I start with making sure to say the other person’s name and then try to reference something said, both so they know I was engaged and for me to better understand and remember the conversation. I have clear memories of times where I was not present and it caught up with me. Those moments are embarrassing because it truly is so easy to just be present and pay attention. I, like everyone else, am very busy and have my attention constantly being pulled in different directions. This is why being present is even more important because hearing something the first time and being able to take action, as well as creating and continuing positive relationships, is a clear path to success. The next time you are talking to someone and find yourself not being present, refocus and find your own system for keeping your mind on what is at hand.